As you already know, I recently took a trip to the Scottish Borders to see my family and I had an incredible time. Check out my latest Adventures with Bee post if you haven't already! My Aunt is packing up and moving to France so she said that I could have a look through my Uncle's old bookshelves to see whether I wanted to take anything home with me. I took around 17 secondhand and used books. Yikes! I thought I'd share a selection of my favourites with you in the form of a used book haul in order to inspire you to go out and get yourself some beautiful books. If you're inspired to raid your family members shelves, please nick the books quickly and quietly to avoid suspicion or ask your family member's permission, whatever...I want to know all about the books you've inherited and the books that you'd like to pass down to future generations so leave your ideas in the comments! Like pretty much everyone else my age, I read Of Mice and Men at school. Unlike the majority of people my age, I actually enjoyed it! Sometimes you just want to sit down and read an American novel, y'know?! I thought I'd rehome my Uncle's old Penguin Modern Classics copy because it also includes Cannery Row that I haven't read yet. Cannery Row is supposedly told through a sequence of vignettes devoid of a real sense of plot so I'm looking forward to giving it a go. I've heard a lot about Steinbeck's other works, particularly East of Eden, so feel free to recommend me some to read. I posted my Brave New World book review just last month but I'm already the owner of another of Huxley's works. I don't think his other books are quite as well known or as highly regarded but I'm looking forward to trying this out! After Many A Summer is about man's desire to live indefinitely so it should be pretty interesting. I have heard so many things about this classic but, admittedly, I have been put off a bit because I've heard it's steeped in racism. A lot of the classics that I've read have been similar though so I guess I should just go for it. If you didn't already know, Heart of Darkness is about a nomadic explorer who travels to Africa to discover how a guy named Kurtz has gained power. We shall see how it goes. Kafka is one of those authors that I've always heard about and seen referenced but also one that I've never really been inspired to read. However, seeing as it was free, I thought I'd give it a go. My Goodreads friends have only given this book 1 or 2 star ratings so I don't have very high hopes for this one but it's good to try things out, eh?! People seem to rate The Metamorphosis highly so maybe I'll give that a go afterwards and see how I feel! I've read some of Orwell's essays before so I thought this would be another collection to try out when I've got a spare minute. This collection covers a lot of different topics so hopefully there will be something to interest me. Check out my Books vs. Cigarettes book review if you're interested in what I had to say about his other collection. I've had Handful of Dust sat on my shelf for a year now but I haven't felt inspired to pick it up yet. However, when I read the blurb for The Loved One, I had an inkling that it would be something I'd really enjoy reading. It's about a guy that finds himself in a memorial park where he eventually enters into a bizarre world full of interesting sounded characters. It's apparently a satire of the cultural divide in America. It's about death too so that basically makes me a happy little goff. My cousin thrust this upon me and said I had to read it so I went with it! I'm pretty glad I did to be honest because it's a pretty well known book and this cover is quite iconic. It follows a guy called Yossarian who is trying to save his skin from the horrible chances of war. There seems to be a lot of positive reviews so maybe I'll devote some time post-uni to it. I've read Romeo and Juliet a few times now but I've never had my own copy so my cousin said I could take my Uncle's copy away with me. Whilst the star-cross'd lovers play isn't my favourite, I do really like it so I'm probably going to have to re-read it sometime soon. 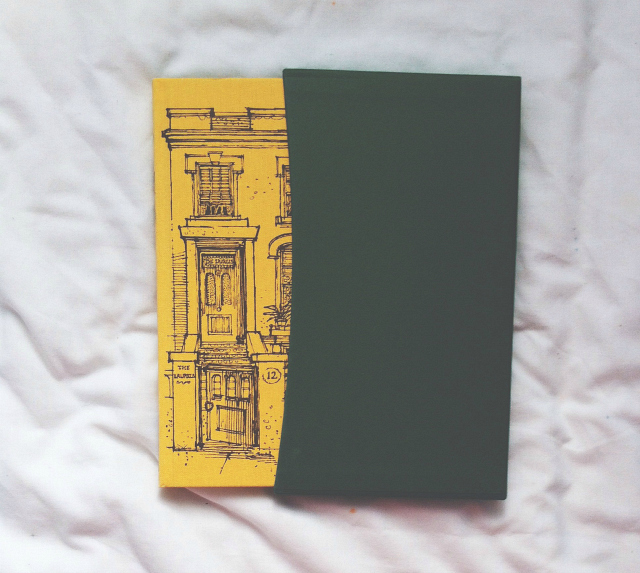 I have an eye for seeking out Folio Society editions and my eyes lit up when I saw this beautiful copy hidden away on a shelf! It's just absolutely stunning. 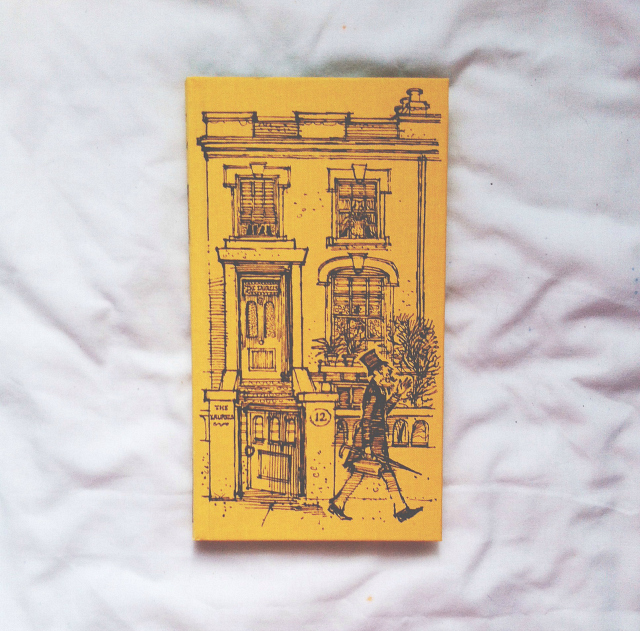 Grossmith's tale is pretty much a suburban exposé, of sorts, that is supposedly meant to be funny in its familiarity. It was first published in 1892 so it's probably not going to be too relateable but I just couldn't resist picking up this beautiful copy. this page contAINS SOME AFFILIATE LINKS. IF YOU'VE USED MY LINKS, THANK YOU. YOU'RE A GOOD EGG. I absolutely adored of Mice and Men I couldn't understand why everyone else was so bored of it! Ahh good old GCSE enthusiasm! 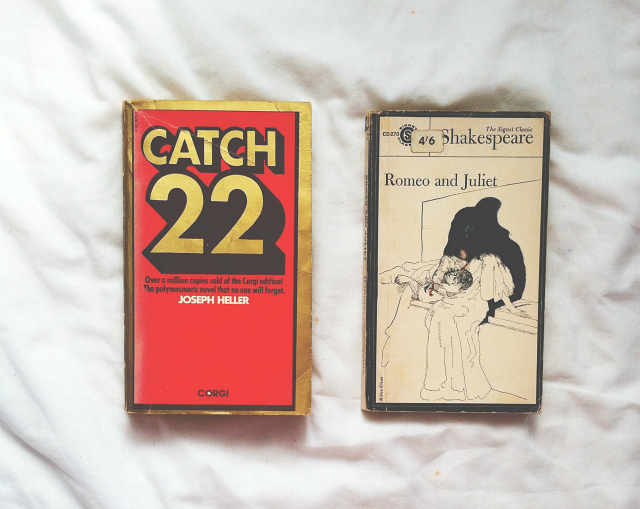 Love that Catch 22 and The Diary of a Nobody! Rummaging for old books is an absolute blast to check out the cover artwork, the font inside the book, and of course that old book smell. You scored some great finds on your Uncle's shelves - the great thing about that is these books hold a lot of memories and so that makes them even more special. Do they have that wonderful old book smell? I just love that. Oh, I love old books so much. The covers are lovely! You made out with some great picks. It makes me wish more of my family were readers. My grandma liked to read, but she read nothing but cheesy romance novels. They have nice covers, but they're not up my alley at all. What an incredible haul, you lucky thing! 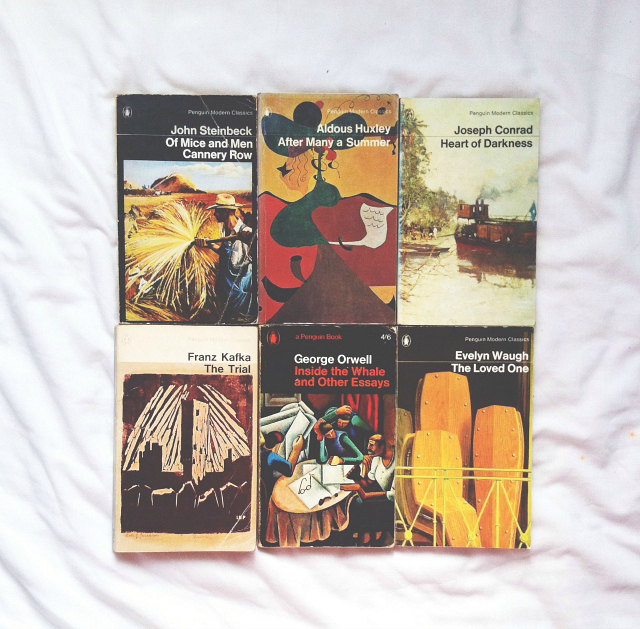 I love the covers of the old Penguins - so collectable. Bet they smell amazing when you flip through them! Anna Karenina is a book my grandma passed on to me which I loved. What an interesting collection of old books. They are always so much better than new ones. Have that lovely 'old' smell!